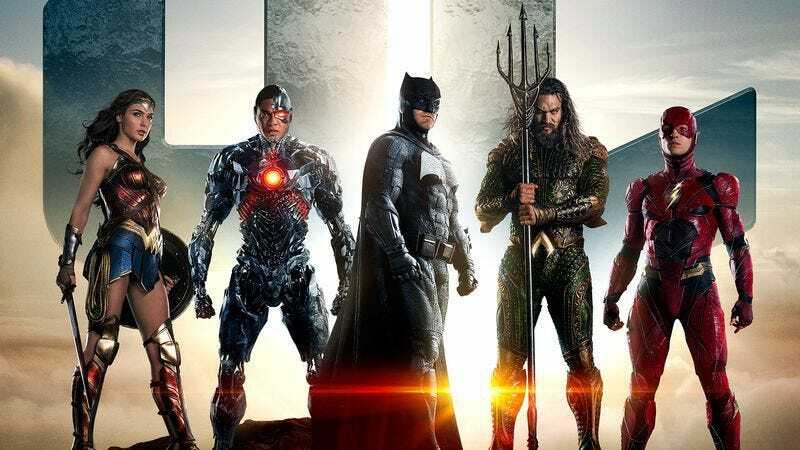 We’re just a few minutes out from Warner Bros.’ live-action movie panel at Comic-Con, which is likely to be stuffed to the filling point with new teasers and promos for the studio’s upcoming superhero tentpole, Justice League. Presumably hoping to whet fans’ whistles for any big announcements, the studio has just released a new poster for the film, and the results are…actually kind of spooky looking. We’re not sure if it’s eyeless, glowering Batman, or just the general resemblance to the album cover for Queen II, but the whole composition is just a little on the off-putting side. On the other hand, the poster does seem to confirm what we all pretty much knew what was going to happen in the film, what with the big Superman logo sitting (not-so) dead center in its text.